This is simply beautiful. Just fab. Fabulous shot and creative touch Madalena! 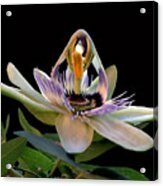 The passion flower is so incredible full of exquisite detail and it is showcased perfectly against the dark background here....beautiful! Beautiful! Love the composition and effect in this! I love the composition of this piece, Mada! Gorgeous!! Thank you:)!! I appreciate so much that you have taken the time to visit, comment and vote on my work. Wonderful effect, Madalena! Nicely composed! Fave/vote! 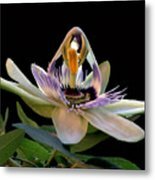 Passiflora, known also as the passion flowers or passion vines, is a genus of about 500 species of flowering plants, the namesakes of the family Passifloraceae. The genus Passiflora is originally from South America. 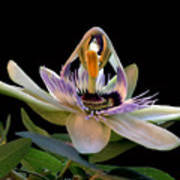 ￿The ￿Passion￿ in ￿passion flower￿ refers to the passion of Jesus in Christian theology. 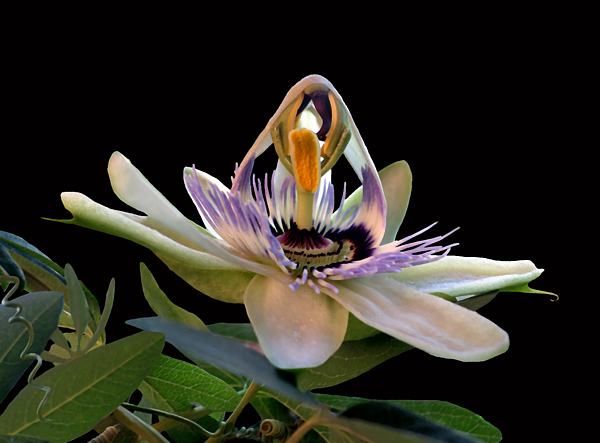 The appearance of the flower, like a crown of thorns, led Spanish colonists to call it Passion Fruit; its structure pentarradial received a theological interpretation, with five petals and five sepals symbolizing the ten apostles (twelve, minus Judas Iscariot and Pedro), while the five stamens represent the five stigmas. Finally, the three pistils correspond to the nails of the cross.